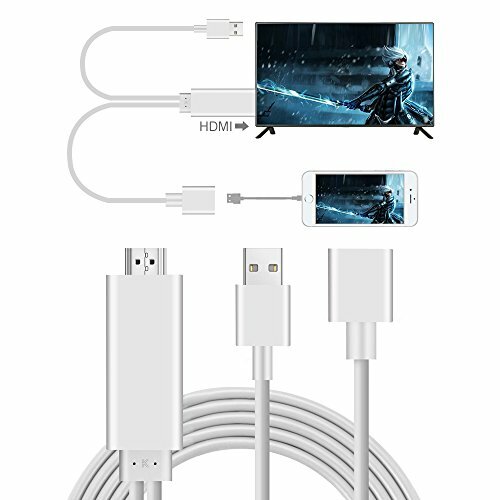 This lightning to HDMI adapter has three ports, please make sure all ports are well connected, otherwise, it will not work. 1. Plug the HDMI port into the TV/Projector HDMI port. 2. Connect the USB port to a power adapter(5V 1A) or the projector or TV's usb port for power. 3. Plug USB female port into your iPhone/Samsung/iPad through charging cable. 5. For IOS System, the phones' screen will pop out a "Trust" option, just click it and it will connect automatically. 6. For Android Cellphones, please open your cellphone" Developer Options", then choose "USB debugging", then click"OK", it's done. Not sure if this is what you need? Is it Compatible with your device? We're here for you. Message us at "support@usbnovel.com" with any questions about compatibility.CLICK "ADD TO CART" NOW! If you have any questions about this product by USBNOVEL, contact us by completing and submitting the form below. If you are looking for a specif part number, please include it with your message.